In 1948 Casimir predicted a universal attractive force (Fc) between two neutral metal plates (area A) at small distances (d), of the order of one micrometer. Universal, because the force is independent of the properties of the metals as long as they are good conductors. Casimir discovered this universal attraction while he was studying some 19th-century physics: the effect of the Van der Waals forces on the stability of colloids. He understood that the attraction arises because the 19th-century concept of vacuum as empty space is wrong. According to quantum electrodynamics, vacuum is not empty at all but filled with particle-antiparticle pairs that emerge out of nothing and vanish back into nothing an instant later. In between the two plates these virtual particles have a lower density than outside. The resulting negative pressure pulls the plates together. For many decades Casimir's "force from nothing" was mainly of interest for fundamental physics. Recently it has become relevant for nanotechnology as well. Micro-electromechanical devices are small enough that their operation is influenced by the Casimir force. At the same time, advances in nanofabrication enable precision measurements of the strength of the attraction, as a test of the fundamental theory and as a fine example of Casimir's Science-Technology spiral. Bronze by Mrs. Noor Köhler, niece of Hendrik Casimir, donated to us by the Casimir family. Hendrik Casimir (1909-2000) merged in his career the two cultures of science and technology. After being trained in theoretical physics by the founding fathers of quantum mechanics (Bohr, Pauli, Ehrenfest), he made fundamental scientific contributions himself as a professor in Leiden and as a director of the Philips Research Laboratory in Eindhoven. While today scientists are encouraged to take an interest in technological problems, such interest was viewed with suspicion in Casimir's days. His postdoctoral advisor Pauli would mockingly address him as "Herr Direktor" and was puzzled that a student of his could find an industrial environment intellectually challenging. Indeed, Casimir's most important scientific discovery, now known as the Casimir effect, originated from studies at Philps on suspensions of quartz powder used industrially. Casimir understood what Pauli did not, that fundamentally new knowledge and novel technology are inter-dependent. In his later years, Casimir would develop his experience into a model for research which he called the Science-Technology spiral. He liked to say that by going from fundamental research into industrial research management, he exemplified as a person what happens to ideas all the time. Hendrik Casimir's autobiography is a rich source of information on Leiden physics in the time of Ehrenfest. We named our joint research school with Delft University of Technology the Casimir Research School, as a pointer to the bridge between science and technology that this school provides. 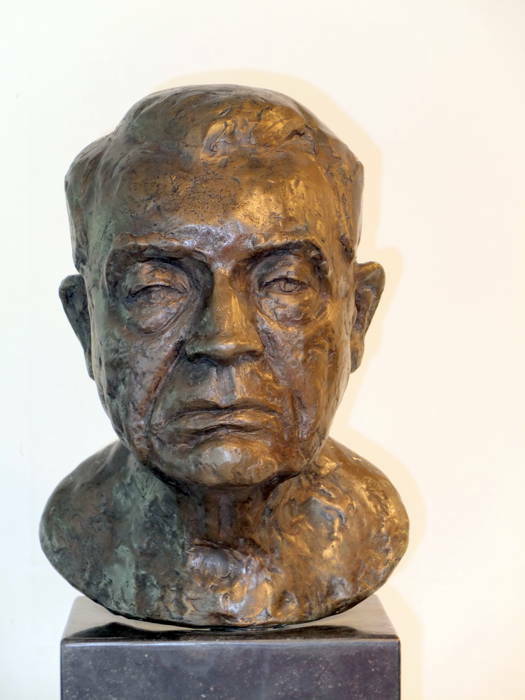 The Casimir room at the Instituut-Lorentz has a bronze of this distinguished alumnus, donated to us by the Casimir family.